After the success of the huge virtual tasting evening that was Durham Brewery's White Stout Event, the great minds of those involved collectively started planning the next event. The idea started with a tongue in cheek proclamation from Durham Brewery's Elly that their Temptation Imperial Stout was a tough act to beat. 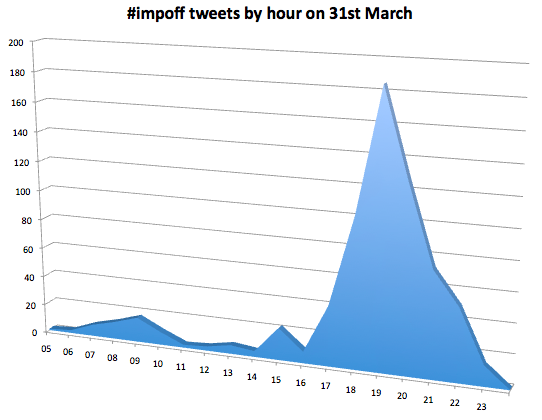 A small amount of banter later and impoff was born - an imperial stout fight to the death to be played out on twitter. 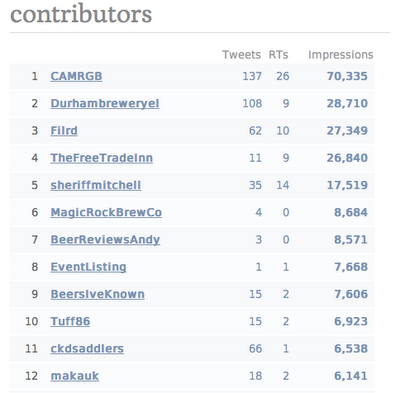 The idea was to get as many people drinking and tweeting about imperial stout as possible. "The coffee infusion on this beer is immense, dark roast bitterness & a healthy kick of hops prepare your palate for a big, sumptuous sweet creamy mouthfeel that rolls into a what can only be described as a long swirling smooth chocolate coffee vanilla marshmallow melt." Comparing that to a mash-up of the words (creating using wordle) tweeters used to describe it while tasting finds broad agreement, although no mention of the creamy mouthfeel. I wonder if we'll ever see a word cloud on the side of a bottle? 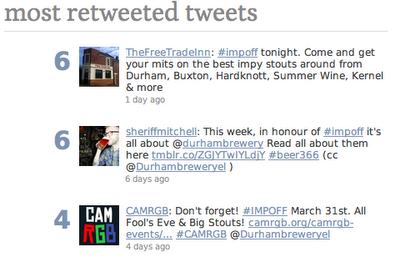 Moving on to the main event, the beery collective of twitter embraced it fully. 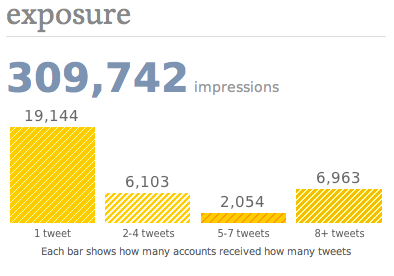 The graph below shows that there were 897 tweets sent in the 8 days between March 25th and April 1st, the bulk of which were sent on the evening of March 31st. From this we can derive that the most tweeted about beers were Durham's Temptation, Magic Rock's Bearded Lady and Thornbridge St Petersburg. I sampled the former myself and I must say it's a great example of the style. My initial description was of dark chocolate covered boozy liquorice allsorts with a sniff of parma violets. It was that kind of night. The Port Brewing Old Viscosity and Southern Tier Mokah that followed it (fortunately I was sharing!) certainly made for a very full on evening. The impoff event was certainly a success and events like this help cement the importance of social media in brewing and most importantly, drinking and sharing great beer. Cheers! All good, nice work Andy. Going to be a hard one to follow up I reckon, the bar's pretty high! Interesting reading, great work. Surprised to see 'celery' appearing in the final word cloud, not generally a word I would asociate with Imperial Stouts. Great to see so many contributors and hopefully I'll be able to get some more mates to come to my next tasting when they read what they missed out on. Brilliant work mate, I really love the stuff you do with these Twitter events, astounding. @Gareth - Ah, I must've missed removing that word. I'll spare the blushes of whoever tweeted it in error! @Justin - Celery was an interesting one! I think the great thing about these events is they work both in person (e.g. at a pub or private tasting) or virtually so they're pretty inclusive. Perhaps that's why they appeal so widely. @Phil - Glad you enjoyed reading. I have an unhealthy fascination with numbers so a chance to combine that with my love of beer won't pass me by!